A. All materials are guaranteed to be as specified. Gutter Masters warrants and guarantees that all materials used in the work are new, unless otherwise specified, and that all work is of good and workmanlike quality, free from faults and defects. B. Gutter Masters hereby agrees to furnish an a 10 year warranty on workmanship and materials in connection with the installation of K- style gutters if said gutters are cleaned as often as recommended by Gutter Masters. Gutter Masters has gutter cleaning contracts that cover this provision. If Owner uses a contractor other than Gutter Masters, and owner makes a claim against this warranty, Owner must provide proof of cleaning. Failure to clean gutters in accordance with this provision nullifies this warranty. C. On all “repitch and repair services” Gutter Masters hereby provides a warranty on workmanship and materials for a period of 10 years if said gutters are cleaned as often as recommended by Gutter Masters. Gutter Masters has gutter cleaning contracts that cover this provision. If Owner uses a contractor other than Gutter Masters, and owner makes a claim against this warranty, Owner must provide proof of cleaning. Failure to clean gutters in accordance with this provision nullifies this warranty. D. All warranties, except manufacturer and supplier warranties, covering material and equipment furnished under this contract are hereby void in the event Customer fails to maintain and clean gutters as often as recommended by Gutter Masters. In the event the Customer chooses to utilize another gutter cleaning service, Customer must provide proof of cleaning. E. In the event Customer installs “gutter guard type devices” or makes any other modifications in violation of any manufacturers’ or suppliers’ warranties to any workmanship or materials provided by Gutter Masters or has another contractor affect the gutters, all warranties provided by Gutter Masters are hereby void. F. Gutter Masters warranties do not include damage caused by nature, storm events, vandalism, or modifications performed by other contractors whether directly, incidentally, or coincidentally to the gutters. 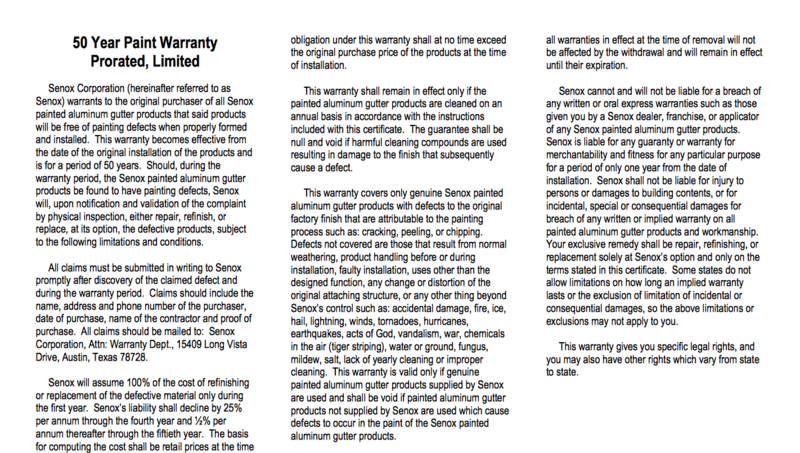 For claims against this warranty please contact Gutter Masters. Your original Paid invoice is required for proof of warranty claim.